Irish piggy bank is a ceramic design with shamrocks that plays the musical melody to When Irish Eyes are Smiling when a coin is inserted. 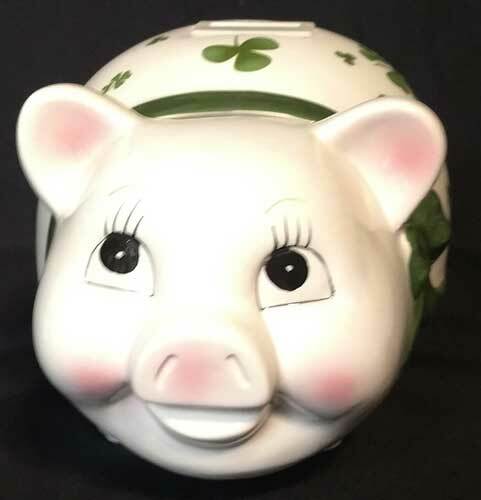 This musical Irish piggy bank would make a fine baby gift or it could be an ideal gift for someone saving for a trip to Ireland. This ceramic Irish piggy bank features shamrocks and is enhanced with pink accenting and a big green ribbon on its neck. The shamrock piggy bank is a musical design that plays the melody to When Irish Eyes are Smiling when a coin is inserted into its belly. The musical Irish bank measures 10" long x 6" wide x 6" tall and is complete with a bottom rubber stopper and padded feet. The musical Irish piggy bank is gift boxed with a shamrock history card, complements of The Irish Gift House. 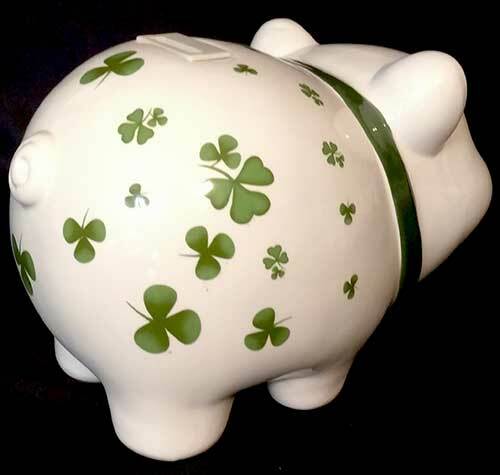 Irish piggy bank is a ceramic design that features shamrocks along with a green bow around his neck. Belleek piggy bank features hand painted green shamrocks along with pink accented facial features. 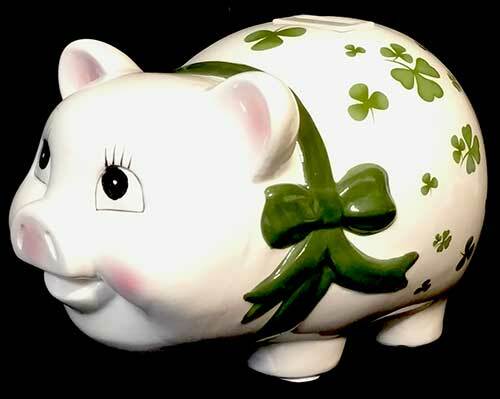 Irish piggy bank features shamrocks along with a bobble-head design.